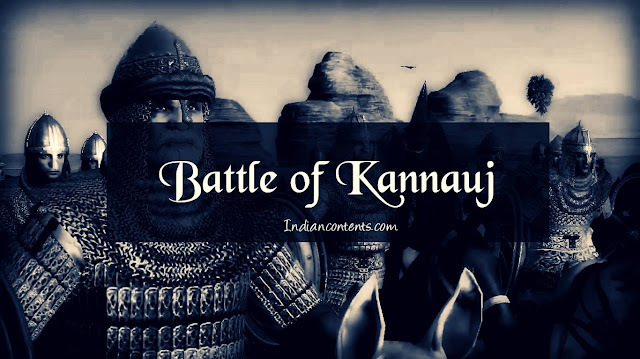 The Battle of Kanauj was fought between Mughal Emperor Humayun and Sher Shah Suri (Sher Khan) of Sur Empire. The battle took place on 17 May 1540. The Mughal forces led by Humayun were completely routed and put to flight by the forces of Sher Khan in The Battle of Chausa fought on June 26, 1539. Humayun just saved his life by throwing himself into the river Ganges and escaped from the battle field. Humayun returned to Agra from his defeat at the Battle of Chausa and tried to seek help from his brothers to fight against Sher Khan. Hindal Mirza agreed to support his brother with his forces, but Kamran Mirza refused to place his forcesunder Humayun's command as he was more interested in taking power for himself. Later, having no chance of taking power from Humayun, Kamran left to Lahore along with his forces. However Humayan managed to gather a sufficient army to fight against Sher Khan. Humayun along with his brothers Askari Mirza and Hindal Mirza marched to Kanauj to meet Sher Khan. And Battle of Kanauj was fought on 17 May 1540. Humayun repeated the mistakes he made during the battle of Chausa. He made many tactical errors and his artillery did not play any major role in the battle. All this lead to the defeat of Mughal forces again in the hands of Sher Khan (Sher Shah Suri). With the fall of Mughal forces Humayun and his brothers again escaped from the battle field and retreated back to Agra. Humayun and his brothers did not choose to stay in Agra since Sher Khan followed them. Sher Khan became the master of Agra and Delhi. Mughal Empire was put to an end for a while because of this Short Sur Dynasty founded by Sher Shah Suri. Humayun lived in exile for next 15 years.